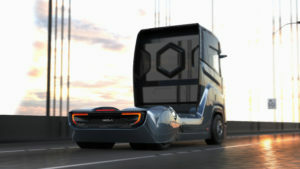 The Nikola Tre has 500 to 1,000 HP, 6×4 or 6×2 configurations and a range of 500 to 1,200 kilometres depending on options. The Tre will fit within the current size and length restrictions for Europe. Nikola says it currently has orders for more than 13,000 trucks. It recently announced a battery-electric vehicle option for the urban, short haul trucking market.